Yup, that’s right. What kind of dumbass does that? I’m claiming it. I’m the dumbass. Sometimes you come unprepared with situations like picture taking with family or friends. It’s almost impossible to attend a gathering without a make up on for the ladies. However, what if you’ve done something else tiring earlier during the day that made your look exhausted and dull. And though it’s supposed to be a happy occasion, you just don’t want to look back because every time you open that photo album, you feel like closing it again instead of showing it to everybody. Uhuh, I know how you feel. That’s why we’re ending you’re dilemma. Today I’m going to use GIMP as my platform. 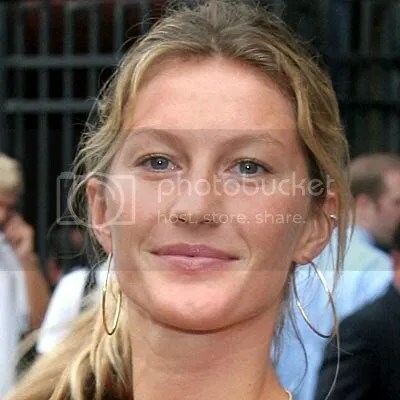 And I’ll use Gisele Bundchen’s(model) photo to improve. Now you may open up your own picture for this. *Note on this picture before I started, I duplicated the original picture twice. 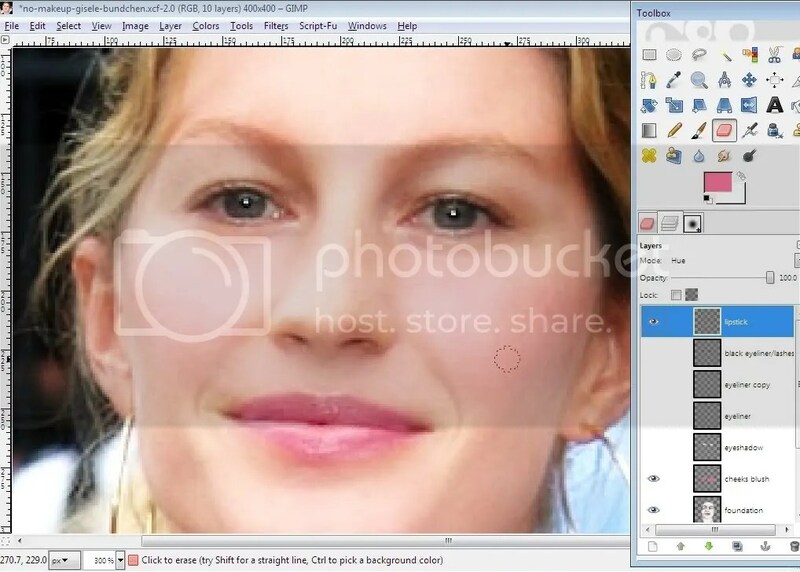 On the 2nd layer: Menu-filter-Gaussian Blur 15%, then place the layer mode to “Overlay”. now the skin and photo texture looks better. I also made the eyebags dissapear(the tutorial u’ll see on my “Painless beauty in seconds” blog). And with the 3rd copy, I placed below every photo, remained invisible to serve as a back up and named it “original layer”. Once you’ve opened up a picture, right click on the thumbnail print at the right side “layer part”. Then click new layer-transparent. Just like how we do make up, we’ll put foundation on first. We’re going to use a white with a very little hue of pink. But the majority of the color should still remain as white. 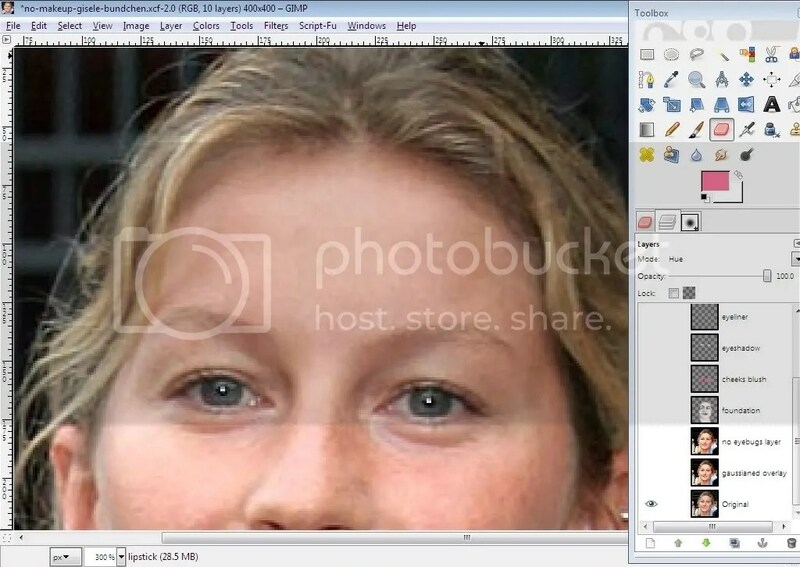 Make sure the transparent layer is highlighted, name it “foundation layer”. You must paint on every face and neck skin avoiding the eyeballs, eyebrows, lips, nose holes. 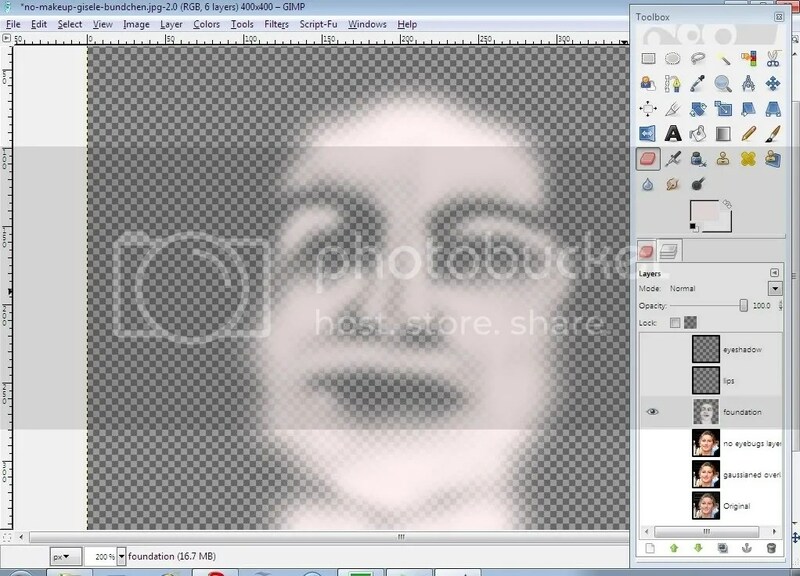 Once done, Go to Menu-Filters-Gaussian Blur 15-20px, click ok. then lower down the layer opacity, to desired color. You could also place it on “Overlay” layer mode, but it depends on what you like. Next, we’ll do the lipstick. You’ll do the same, almost exact procedure. Make a new transparent layer. You could pick any color you choose, any thing in between red and pink is safe. Make a new layer then name it “lipstick”. Use the fuzzy brush and paint on the lips. Go to Menu-Filters-Gaussian Blur 7-10px, click ok. Then lower down the layer opacity to around 10%-30%.You could play around and experiment with the colors without changing the actual color or touching the color pallette, simply by changing or scrolling down the layer mode to overlay/hue/screen or whatever you wish. Now make a new layer again- a transparent one. Name it “blush on”. then go to Color palette and pick a color somewhere in between red and pink. Once you’re ok with the color, use the fuzzy brush and paint the cheek portion and forming a triangular shape, inverted downwards. Get to the filters menu then Gaussian Blur, around 10px. Finally, lower down the layer opacity(10-40%) ’til you get the natural blush you needed. Above you’ll see the original eye portion w/o make up at all. Now this time, were going to put eyeliner on. Make another transparent layer, and name it “eyeliner”. Let’s use color black for this. then using a small fuzzy brush will draw a line around the eyes, or better yet draw on the eye outline itself. 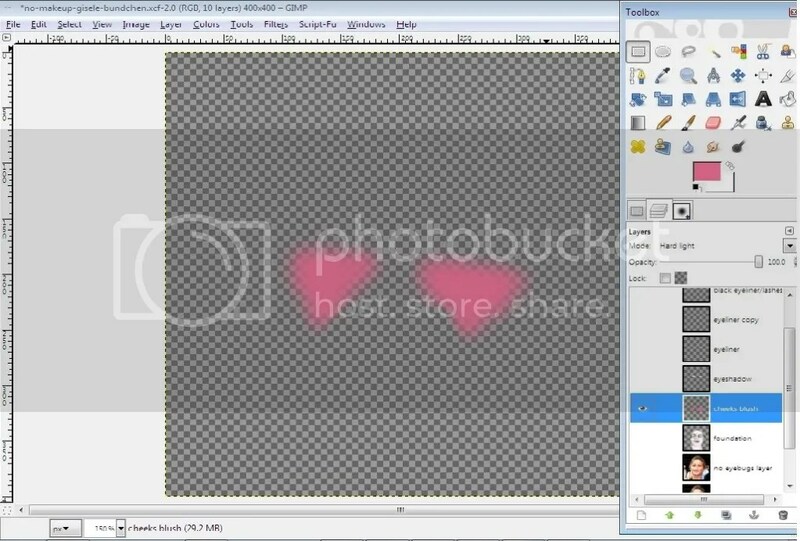 And then go to Menu-Filters-Gaussian Blur 10px, click ok.Then lower down the layer scale opacity according to what’s enough for you. Here I’ve used an eyelash brush(http://project-gimpbc.deviantart.com/art/GIMP-Eyelashes-Brushes-63531352) I’ve downloaded, and used it to thicken her eyelashes. You could also do the eyeshadow, by doing the exact same techniques. Here I’ve chosen a blue green eyeshadow (HTML notation: 7dbebe). Keep playing on the layer mode ’til you get a good hue of the color you have chosen. 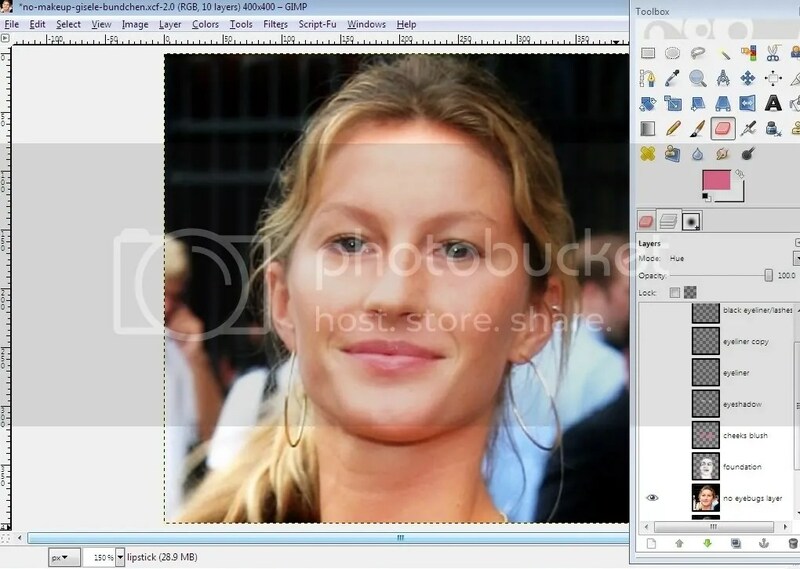 You could also duplicate this layer then play with the layer mode, and you’ll see a richer effect. Make a habit of saving this as a whole project before merging all layers down. So you could get back to it and make changes as you like later on. Now to save it as a normal photo. you must flatten this image first. If you think you’re satisfied with the make up and would like to make it final, right click on the layer and merge it down to the Original photo.Or better yet, if you’re finished with everything, right click and merge all visible layers to make the procedure quick. Now, you don’t have to be afraid to look dull on camera. After all, you could do the make up after the shoot anyway.